Also, I have just arranged for a new e-mail address to be used for prayer petitions to the prayer circle. Apparently, the old e-mail address was constantly receiving junk mail and would often block prayer requests from being received by our prayer circle. A blessed statue of St. Francis has been dedicated and placed in an altar for the petitions you send. If you have tried to get e-mails and prayer requests sent back or you didnt notice them posted to the site, I apologize. St. Francis has surely heard your prayers, even if I was not able to make the petition for you. A good brother had assured me that your prayers will be said over a relic of St. Francis, however, his e-mail has been lost to us. If you know of another who would wish to fulfill this job please let me know. The new e-mail address has been updated on the site at multiple places, but if there is a place that we missed please let us know. 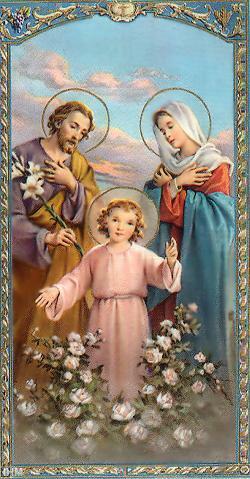 If you have a petition you wish to present to the Holy Family, please leave your name and your petition and we will pray along with you to the Holy Family. All e-mail addresses and petitions will be kept confidential unless you wish otherwise. If you wish that your petitions be posted on the webpage, please mark yes or no on the PS section. God Bless. SB asks that she be committed to things of God.